How many scoops will you need for 3 hot chocolates? This 3 act math task was inspired by work we are doing at my district around fractions, measurement, and proportional reasoning. In this real world math task, we’ve attempted to create a task that is accessible by students in Kindergarten and primary grade levels, but could be extended into the later grades by simply asking more complex questions with intentionality. While I typically have students do a rapid write of what they notice and what they wonder, if we are in a kindergarten through grade 3(ish) class, it’s likely that students are sitting with you on the carpet. In that case, it might make more sense for them to think of what they notice and wonder in their minds and then share out with their partners through a think, pair, share. When sharing with your neighbours, do not share any numbers that you might have noticed or wondered. We were lucky that this pre-planned instruction came to mind right before we led the task, because otherwise, some students may have immediately came up with “9” as an answer and then the task as well as the sense making would likely be dead. I wonder if the hot chocolate is already made in the container? I wonder if someone is making hot chocolate? I wonder if that is YOU in the video. At this point, we hadn’t landed on any particular wonder yet. We then said… let’s watch this video to see if we have any more noticings and wonderings. I wonder if the person is going to make more hot chocolate? I wonder how many scoops they’ll need. I think I know! I wonder who is going to drink the other hot chocolates? I think this person is going to be making 3 whole glasses of hot chocolate! Why don’t we start by thinking in our minds about how many scoops we needed for the first glass and then how many scoops we’ll need for ALL 3 GLASSES? BUT – we don’t just want to know how many. We want you to convince us of how many in any way you want. Manipulatives are on your tables, so with your partner head to your stations and try to make a plan of how you’re going to convince us of how many scoops were needed in total to make 3 hot chocolates. And, they were off to the races. Integer chips (or “circles” with one colour on one side and another on the other). We would have liked to have relational rods on the table as well, but there were none available in the manipulative kit we were working with. Bummer. What do you think the students might do with this task? My challenge to you is to leave a comment below anticipating what you think students might do in a grade 3 class. You can also anticipate what would students in YOUR class do to convince you of the total number of scoops? How might you modify this task to work in your classroom with your diverse learners? If you want to be bold, test what you’ve anticipated by doing the task in your classroom and come back to report your thinking in the comments. 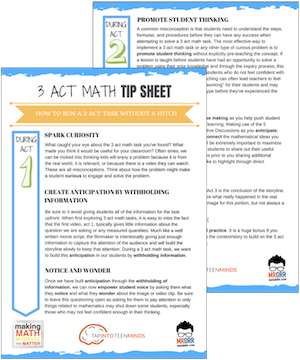 Download the media resources and 2-page Hot Chocolate 3 Act Task Tip Sheet that you can print and have with you close by to ensure that you maximize your chances of Making a Math Moment That Matters for your students! After consolidating learning using student generated solution strategies and by extending their thinking intentionally, we can share what really happened with this video. I hope you enjoy the task! Don’t forget to take on the CHALLENGES I’ve set out for you. Looking forward to hearing from you ALL in the comments! Remember, we don’t learn if we don’t reflect. There are quite a few different directions you could go in after this. How many scoops do you need for 3 whole glasses and 1 half glass of hot chocolate? Can you show your thinking using additive and multiplicative thinking? How many scoops do you need for 27 glasses? How many scoops do you need for ANY number of glasses? How would you describe this? How many glasses of hot chocolate could you make if there were only 55 scoops of mix total in the container? Cara had a great question about how we might ask a question that would illicit division, which had me thinking. Check out her comment and my suggestion here. As mentioned in many of my tasks, the learning goal you have selected for a task may be different than what I have in mind. This is especially true when we consider that this task could be used in a variety of classrooms with varying levels of student readiness. In a primary classroom, we might be focusing on helping students build their additive thinking skills with the hope to push their mathematical thinking vertically towards multiplicative thinking through equal groups. As you can see in the image below, my students might be at a level of abstraction requiring tangible objects (i.e. : the actual glass and scooping hot chocolate mix or sand or similar into glasses). Other students might be able to DRAW the glasses and spoons. One of my learning objectives might be to try and help students make connections between more abstract drawings such as the representation we see when students draw ovals with 3 circles inside to represent the 3 glasses and 3 scoops. The importance of moving towards this stage when students are ready is to help them see that while drawing glasses and spoons is very helpful for this context, it is not so helpful when the context changes. When we use something more like the ovals with circles inside, that very same visual/drawn representation can be used to model ANY context involving 3 groups with 3 items in each group. This can be helpful prior to moving on to the abstract representation using symbols like 3 x 3 = 9. Depending on the students in the room, they might be ready to take a set model of say placing 3 concrete objects in 3 groups (i.e. : linking cubes, counters, etc.) and with a bit of a push, might be able to begin creating linear models or “number trains” as Cathy Fosnot calls them in her Minilessons books. In the image below, a student is sharing her strategy of building a number train to help her determine how many scoops are in 3 glasses. What is useful to note is that while she is explicitly counting the number of scoops, the 3 groups of 3 colours used helps her keep track of how many glasses she has as well. This is a huge step in the direction of proportional reasoning where she is now working with two quantities that scale in tandem. By helping students to make the connection between set models (i.e. : random counters and concrete materials put into “piles”) and linear models like number lines and in this case, a double number line. When students are ready, they can begin to use their concrete number trains to trace a single (and eventually double) number line on paper with the goal of building more sophisticated strategies that will help in the area of multiplicative thinking and algebraic reasoning. When students are given opportunities to use tools “with legs” that are far stretching for thinking and representing their thinking, this lowers the floor on tasks and also raises the ceiling through the use of extension problems and prompts. If we are to look at a developmental continuum with a focus around the double number line (linear model) we can see that connections can easily be made to continue mathematizing vertically. Yes. It’s division. Not one student has been able to identify that we could have come up with the same result by simply dividing the number of scoops by the number of scoops per glass (55 scoops ÷ 3 scoops per glass). Furthermore, when we say it is quotative division, students have never heard that word before and are unaware that there are two types of division. Over time, you can move from the double number line and ratio table to a proportion. It should be noted that cross multiplication, the magic circle, y-thingy-thingy, or any other tricks are not necessary by this stage because students are visualizing the double number line in their head and are very flexible with ratio and rate reasoning. Where x represents the number of glasses and y represents the number of scoops. We could graph and have all kinds of fun from here. So. What is the learning objective for this task in your class? Let me know in the comments! How many spoonfuls would we need for “our” class to each have a glass of hot chocolate? What measurement of a spoon are we using? Is it an accurate measurement? What would happen if we used a smaller measurement? What do the instructions on the can tell us about how to measure the hot chocolate? How many units (grams) are in the whole can? How could we find out how many grams we use for one glass of hot chocolate? Can you find a mug which has the same capacity as the glass? About how many ml of water do you think is used for one glass? How many glasses can be filled with one full kettle of water. I love these, Bernadine. Thanks for sharing!! How could this task be made into a division problem? Or what questions could I ask to allow my students to see it as a division problem? Great question! After act 1 and the notice and wonder, the beauty of a 3 act math task is you can take it wherever you want. You don’t necessarily need any photos or videos to support your questioning. Once they’re “in”, they’re “in”! So, my thinking is… if you’re after division, you might say that in an entire container has _____ scoops. How many glasses can you make? This would be a quotative division problem. Unfortunately, if you use the act 2 video where they see how many scoops per glass, then you wouldn’t be able to access partitive division. However, if you only showed act 1 and SAID that you made 7 glasses of hot chocolate and you used 21 scoops, how many scoops were added to each glass, you’d be attacking partitive division. We’re using this tomorrow with teachers as a whole school 3 act math experience. Going to put out the challenge for every class to try. We will share more of the results after! Can’t wait!! Let us know how it goes! I did this question with grade 2 today. After video 2 I asked what might the math question be? Had some suggestions such as 1+2 =3 etc. kids eventually worded the problem from the task with math terminology included. Very exciting to open it to them. Also asked a grade 3 working on it to extend and create a new problem. His problem was how many did he need for whole class? He used a different math strategy to calculate his answer as well. This is great to hear, Penny! So happy to hear you were able to make it into a grade 2 class and share your experience here! I had the pleasure of doing this task with a grade 3 class recently and a couple different grade 7 classes. It was fabulous learning. Hello I am interested in how the task turned out with the Grade 7 classes. How did you get them to think deeply. A colleague (Yvette Lehman) and I went into a number of grade 7 and 8 classrooms and extended the task asking students to determine how many glasses could be made if there were 55 scoops left in the container. The key was stating they needed to convince us (saying an answer and showing nothing else wasn’t enough). We also said without a calculator. As you can imagine, some students could come up with say “18 glasses” but couldn’t show any conceptual understanding. This is where we introduced the double number line and had them use it as a tool for thinking. Great fun and lots of learning! In anticipation of launching this tomorrow in a 7/8 class and wanting to offer a considerable distance from “floor to ceiling,” I have collected the following details to supply for other extensions/wonderings: 500 g canister, 2.49, dry measure equivalents 3 tsp = 1 tbsp = 14.3 g. While some students are working toward input/out table or double number line, I am hoping other groups will take this in different directions that will challenge them. I intend to keep it open enough that their inquiries determine the information I share, as well as how far they go.